Acacia longifolia does grow here in the forest, but it certainly doesn't thrive. The plants are typically spindly and are often bent over and broken long before they reach their potential 6-7 metre height. And we now know at least one reason for this! 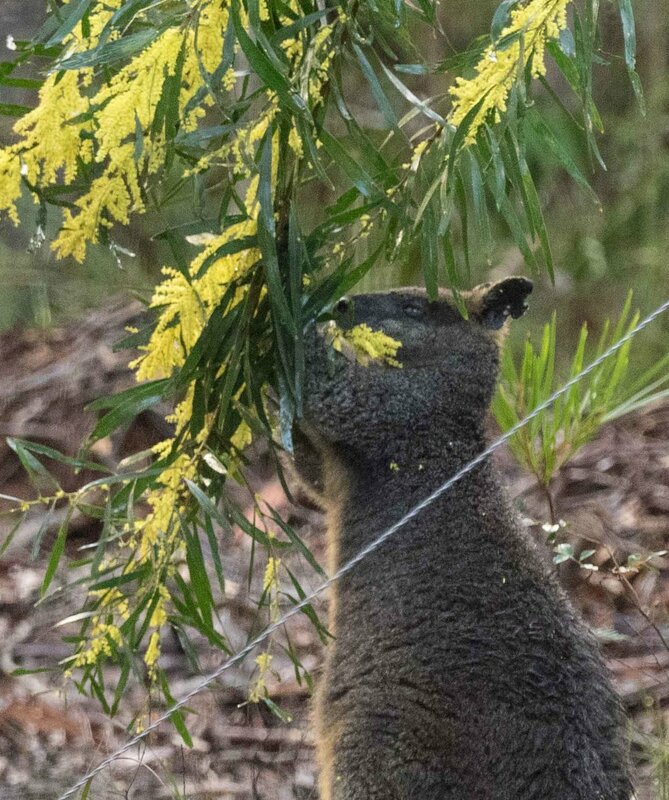 Early Monday morning, after a night of rain, we looked out from the house to discover this male Swamp Wallaby feasting on flowers. 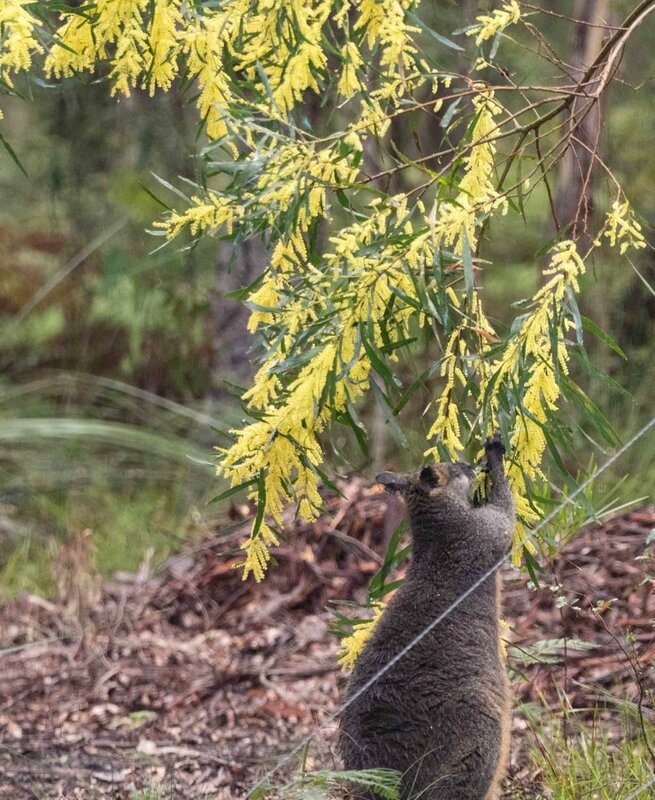 The wattle was already drooping under the weight of the wet foliage, and was just in reach of the persistent wallaby ... with a bit of stretching! 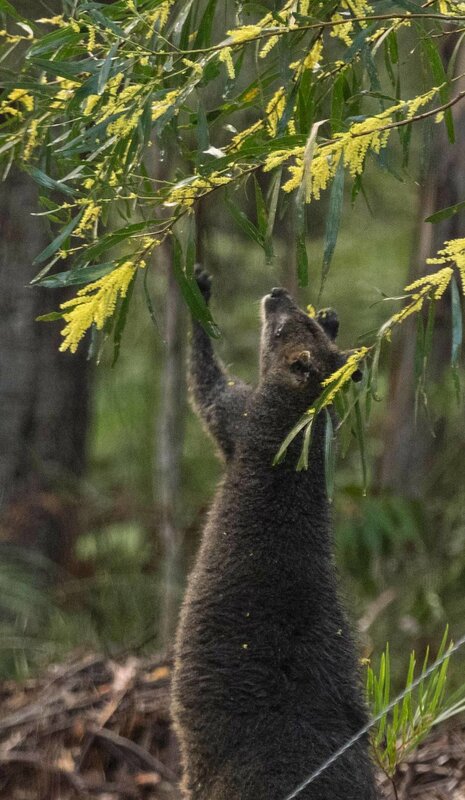 He spent the next hour or so pulling at the branches and nipping off the flower stems. In this instance, the tree trunk didn't actually break but it wouldn't have taken many more tugs from the persistent herbivore. 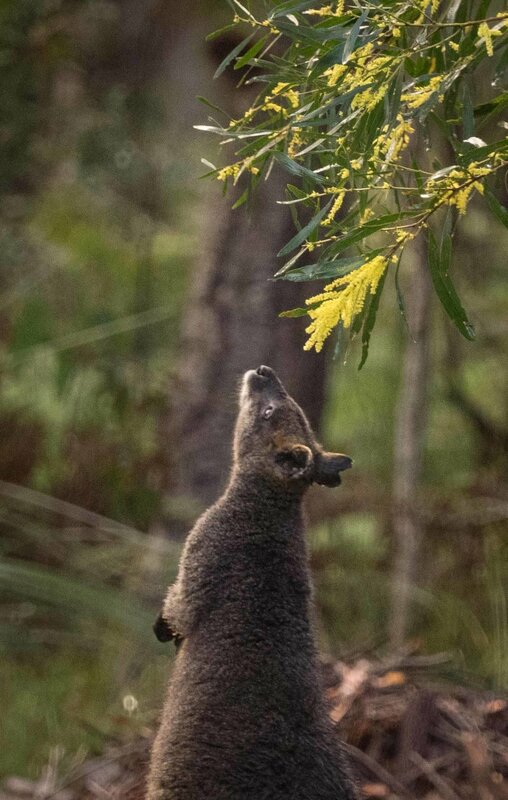 Swamp Wallabies are widespread across eastern Australia. They spend the day hidden among dense ferns or shrubs, emerging at dusk to forage in more open areas throughout the night. 'Swampies' are typically solitary animals. Evolutionarily, this species is distant from most other wallabies and kangaroos. 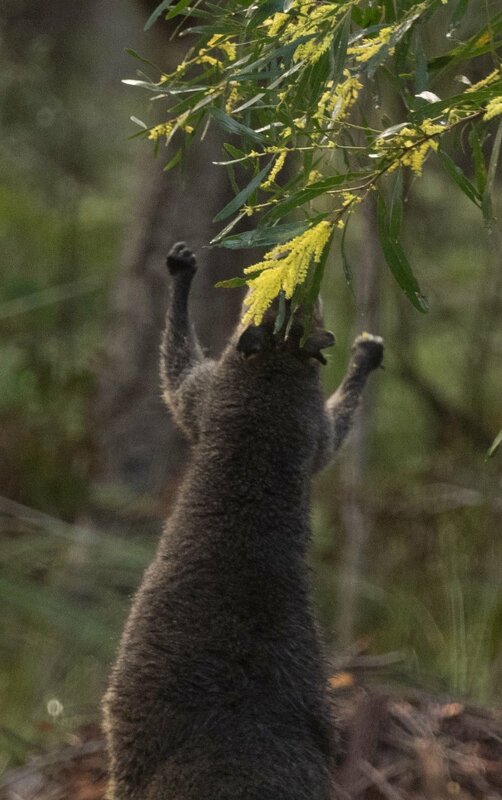 In fact, our local Eastern Grey Kangaroos (Macropus giganteus) and Red-necked Wallabies (Macropus rufogriseus) are more closely related to each other than either is to the Swamp Wallaby (Wallabia bicolor). The distinctive behaviour of the swampies also sets them apart. In particular, their preference for browsing on coarse shrubs and trees. They even eat bracken fern. This particular male is familiar to us. Like most males we have seen, he has torn ears, presumably from battling other males for mates. He also has a blind eye, yet he seems to manage just fine. They can apparently live for 10-15 years. These photos were taken at a distance, and through our house window glass (hence their poor quality). Swampy Wallabies are more wary than most other wallabies and kangaroos. He would have bounded away with a characteristic heavy 'thud' had I tried to approach him, probably just as I'd opened the door. Acacia longifolia is native to the coast and coastal forests in our region. However, it is considered a pest in some places. As an attractive plant capable of stabilising sandy soils, the species has been widely introduced elsewhere. It is now a declared weed in Portugal, South Africa and even in Western Australia.